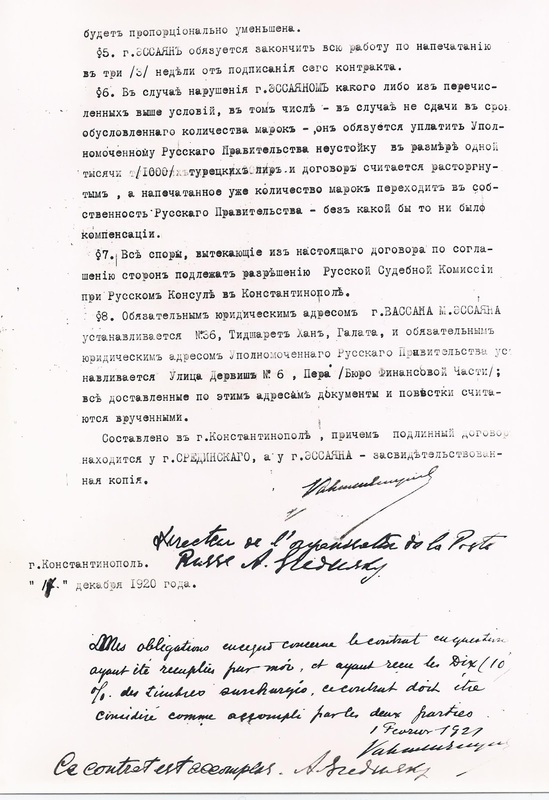 A New 1922 Postmaster Provisional from Kharkiv? How do you know when you have made a discovery? Above are two halves of the back of a cover sent from KHARKIV 15 9 22 which transited MOSKVA on 18 9 22 and arrived in BERLIN 27 9 22. 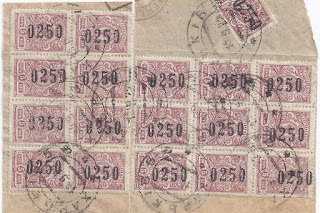 Without overprint if 18 stamps of 5 kopeks were revalued x 100, then they would pay a 90 rubel Registered tariff, assuming no stamps on the front of the envelope. 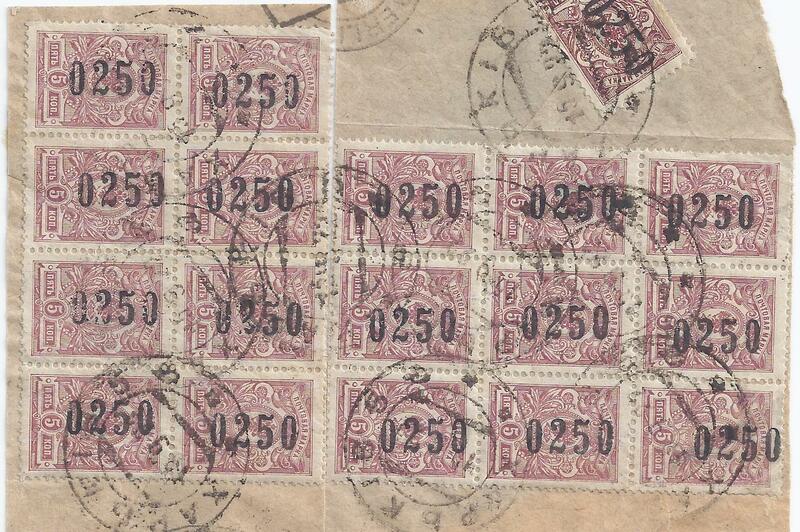 But in 1920, Kharkiv 5 kop stamps were revalued x 100 by means of black pyb overprints, which are very common. Maybe by September 1922, those overprints had been used up. With the 0250 overprints shown here the stamps would pay a 4500 = 45 rubel ordinary letter tariff, assuming there were no stamps on the front of the envelope. But is the 0250 overprint genuine? I have not seen it before. In favour, there are two things. First, the overprints appear to be under the cancellations and the KHARKIV cancellation appears to be genuine. When an overprint is heavy and a cancel light, it is always hard to be sure, but under natural light and under magnification, every way I look, the cancels do look as if they are over the overprints. That is essential. Second, I am told that another example of this overprint on 5 kop stamps with KHARKIV cancels is in a St Petersburg collection. In this case, the stamps are imperforate. 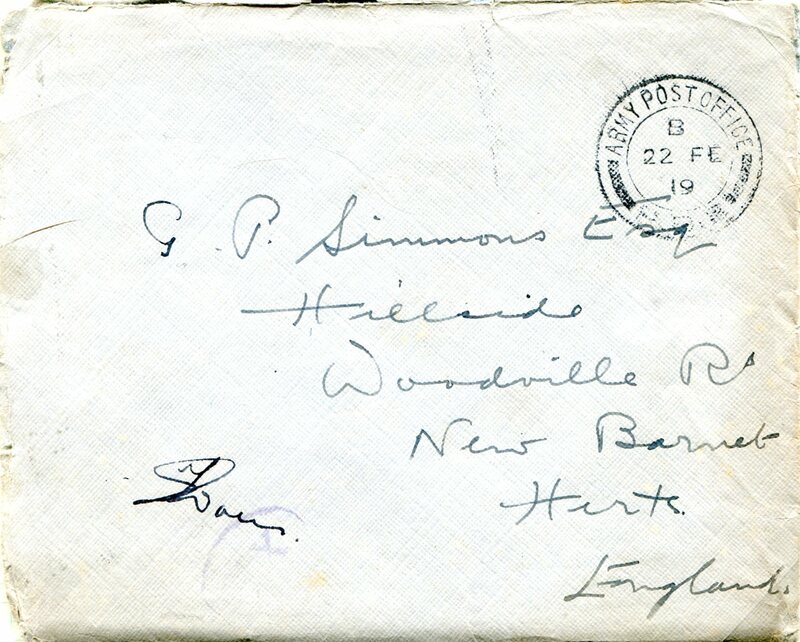 The cancel is not the same one, which also helps support the idea that the KHARKIV cancel on this cover back is genuine: a forger would not waste time and money making two different cancels. Against this is the simple thought: How come a Postmaster Provisional from a big city like Kharkiv has not been recorded sometime in the past 100 years? That is a serious question. The best answer is for one of my readers to produce another example of this overprint, ideally on a 5 kop stamp with a Kharkiv cancel – a heavy cancel would be nice! Discussions are ongoing: I have discussed with Joseph Geyfman and he has discussed with Alexander Epstein ... We are still talking about probabilities rather than certainties so we really need some new evidence. See also now comments below from Ivo Steijn. UPDATE 30 May 2018 Tobias Huylmans offered to look at the item using his specialist BPP equipment. He could not get a definite result. This is partly because the inks of the overprint and the canellation do not show the kinds of fluorescence which would enable him to get a contrast. So we still need new examples of this overprint before we can make any progress. New Light on the 1921-22 Stamps of Armenia: Essayan and Khatchaturian? I have blogged frequently about the first two pictorial issues of Soviet Armenia, their designer Sarkis Khatchaturian and their printer Vahan Essayan. We already know that Khatchaturian went to Constantinople in 1921 to discuss the new stamps he had designed. He was working for a government which had no money and instead he was provided with sample stamps, the so-called First Star issue, which he was authorised to sell and thereby - I think - fund his trip. From the following letter, it seems this plan did not work out as intended. 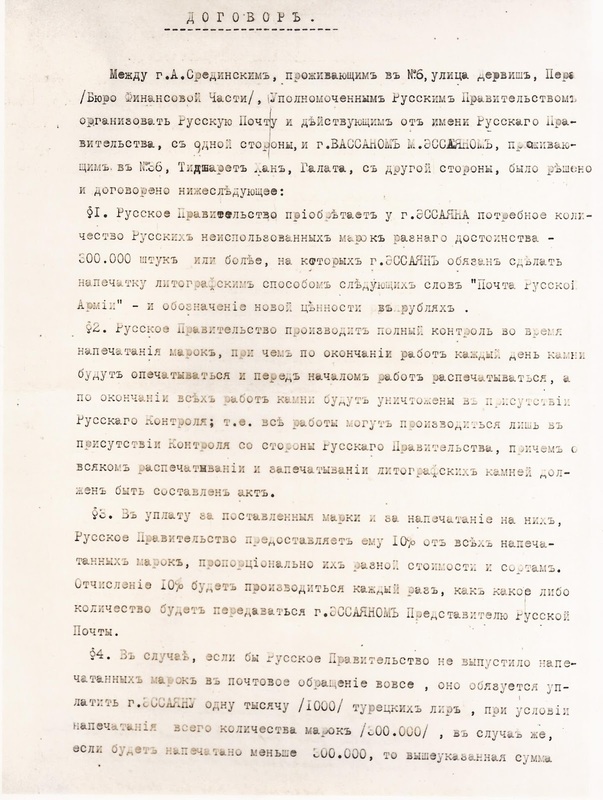 Khatchaturian is using Essayan's notepaper to provide a Poste Restante address (hence the French endorsement "pour ..." at the top left of the sheet). 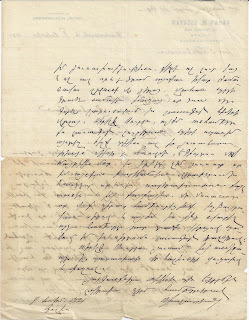 He is writing about a previous letter asking for financial help from Dr Souren Hovhannisian (who may be living in Egypt) either directly or through an intermediary. The writer's wife is willing to travel to collect funds. My guess is that Khatchadourian is approaching family or art world contacts for help. He was already a significant figure in the Armenian art world, and today the National Gallery of Armenia holds many of his works. I am grateful to Haik Nazarian and Stefan Berger for tackling the translation and interpretation of this letter. Howard Weinert has sent me this fascinating letter from a British soldier in Archangel which contains detailed information about the postal service, and the collectible stamps he has been able to obtain from "Master Tarasoff". There are footnotes Howard has provided to explain some of the more difficult points. This afternoon I have a little time to myself, so will write you a few lines to apologize for my last hurried note posted some few days ago. I am glad to say that at last a regular sleigh route has been opened between here1 and Murmansk and we now have a weekly service of mails to and from that place. Perhaps it will be more correct to say that we shall have, as the new arrangements start tomorrow. 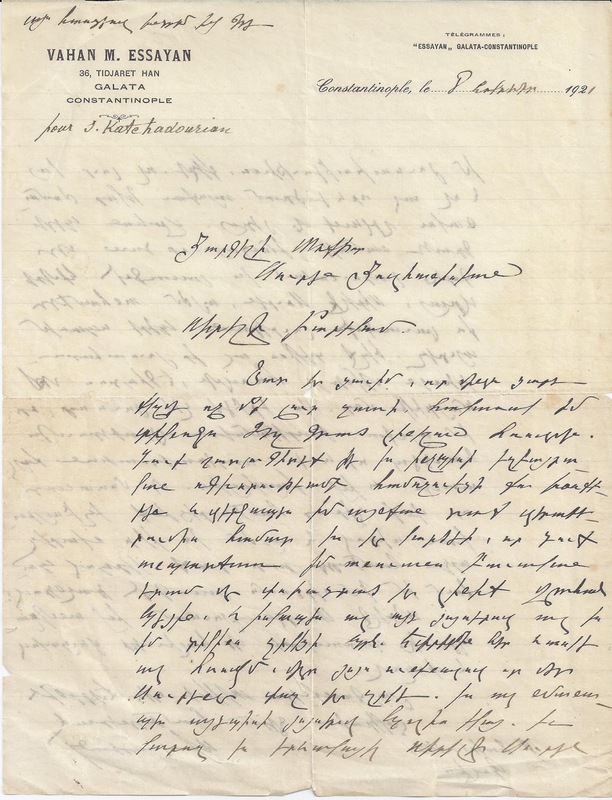 This letter will be the first sent by this route and before it reaches you it will have traveled several hundreds of miles by dog or reindeer sleigh before it even gets loaded on a ship at Murmansk. Navigation even to Economia Point2 has finished now and the icebreakers push for about 10 yards and get frozen in again, before they can get a start. Imagine ice from 6 feet to 10 feet deep. No need to feel “toey”3 when you have got that beneath you. Regular sleigh routes are open between most of the outlying districts, and proper posting points, where there are wigwams and a change of reindeer, are available on the journey. The Boss has gone today to an island (which figured in the operations here last August) named Modugski4 in the White Sea. It is a good way away and the winter trail is not particularly well marked so I must say I don’t envy him the journey. He is well armed in case of wolves so I suppose he will come back safely. 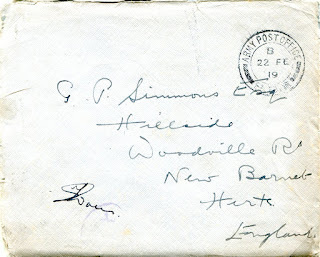 Well, it is some time since I have had any letters from home now but am daily expecting a mail in. I think I shall be homeward bound in a month or two. A day or two ago a letter arrived marked “very urgent.” I really thought I had got a blighty5. I have since found out from the Records Office that a return of all 1914/15 men eligible for release had to be telegraphed to England, and they had questioned my eligibility. When you think of the date that I left home in 1915 you can see that it was a pretty near thing. This office is getting snowed in with demobilization forms and returns etc. and I am really inclined to wish that the blooming war was not finished. Last Sunday I spent the whole of the afternoon and most of the evening interviewing each of the units separately and filling in their forms and learning all their past family history. Each man made a full confession of his past life. I can fully sympathize with Fr. Lynch on a cold morning. How is poor old Bernard6 getting along? I am writing my next letter to him, but will address it to “Hillside” in case he may have moved his quarters or even been demobilized. I think I asked you in my last letter to keep an eye on the Daily Picture Papers for snaps of the old Sanitary Section. Well, the paper which will probably print them will be the “Illustrated London News.” The Boss has posted by this mail about six prints which they will probably make use of. I did the actual taking of all but one of the pictures. Therefore I am only on one of them, and that is the one where the Sanitary Section (some of it) is leaning against the fence by the billet7. The temperature was so low (even though the sun was shining brilliantly) that I could barely manage to take the cap off the camera. 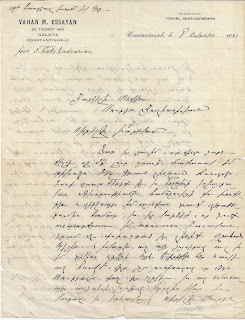 I am enclosing one or two more snaps with this letter, which will help to swell the collection. No. 1 is taken from the government house and shows the Archangel town hall (the Arkhangelsk gorodskaya duma) on the left, and one of the several fire stations on the right. A toboggan run8 has been erected close to this town hall, and the top reaches nearly three quarters the way up the tower. The gradient is so steep that you run along a perfectly level road nearly the length of Woodville Rd (to St. Marks) and then you reach another big dip which rushes you right far out over the Dvina9. No. 2 was taken from the bridge of the City of Marseille10 while on the high seas. You can just notice a few men about with their life belts on. The rest of the crew are probably “busy” downstairs, just longing for a tin fish to pop up and finish them off. No. 3 shows the “North Pole” Picture Palace. I think I sent you a ticket of admission to the place some long time ago. No. 4 is quite interesting. It shows the pile driving machinery actually at work. The method of working is this. Piles are floated down the river lashed together to form a raft. They are brought alongside the machine, and a haulage chain is fastened round one end of the log. The machinery is set in motion and the log is hauled bodily out of the water and fixed in a vertical position beside the upright shaft of the machine. These logs very often reach three quarters of the way up the shaft. The log is then lashed to the shaft and allowed to slide into the water until it touches bottom. A steam operated hammer (which in the picture is seen at the bottom of the machine) is hoisted to the top of the shaft and allowed to play on the top of the log which it eventually sends many feet into the river bed. When you think that it is a very large dock and when you see what a quantity of piles have to be driven to make even one small corner, you will understand what the building of the place must have been. This view was taken (I think) from the stern of our ship. No. 5 shows in detail the construction of the walls of a Russian hut. Notice the jointing and remember the carpenter only used an axe. Isn’t it wonderful? I have got several more to send you but I won’t send too many at a time for fear of them getting lost at sea. Now about the stamps. The registered letter you mentioned has not turned up yet, and if you have not posted it I think you had better hold on to the good stamps. It is a case of throwing pearls before Russians. So far my efforts at sale and exchange have not met with any great degree of success, but I have not started my campaign in earnest yet. I am enclosing one or two specimens which I hope you may be able to make use of. There are four rather nice specimens of the 7 ruble (imperf.). Also three specimens of the 3.50 but unfortunately I could not get hold of any of the inperf. issue. The 40 pfennig German I take to be a German war stamp. I have not seen a copy before. The three German surcharged Belgians are not new to you but I got them for a few kopecks, as I don’t think that specimens appear in my collection. Do you recognize the Finnish stamp? I don’t know it. As it is now impossible to send or take more than a few rubles out of the country, I shall spend my spare cash on unused Russian stamps. What the dickens is the stamp surcharged “Dardanelles 1 piastre?” I have got one or two Russian surcharged China in tow and there are several others which Master Tarasoff11 will have to disgorge in the very near future. Our English postage due seems to be unknown. I priced them as follows: 60 k (1/2 d), 40 (1 d), 50 (2 d), 1.20 (5 d) and shall hope to do business in a day or two. Didn’t finish this letter last night on account of our Russian class. Did I tell you I had made a start with it again? We have had four lessons so far. It is a terrible lingo to write. Am just waiting this afternoon for a posting sleigh to arrive to take me over to Solombala12 which is a place some little way north of Archangel, and then I want to get back and drive down to the P. O. with this letter. Must stop hurriedly as the sleigh has just this moment arrived. Excuse hurried ending but I have a good long round to go and shan’t get this letter away unless I finish it now. 1Arkhangelsk was frozen in by January, so once a week mail traveled 300 miles (5-6 days) by sleigh to Soroka, then by train to Murmansk, which was ice-free. 2A new port 16 miles from Arkhangelsk. 3Nervous. 4Mudyug Island was 30 miles north of Arkhangelsk. 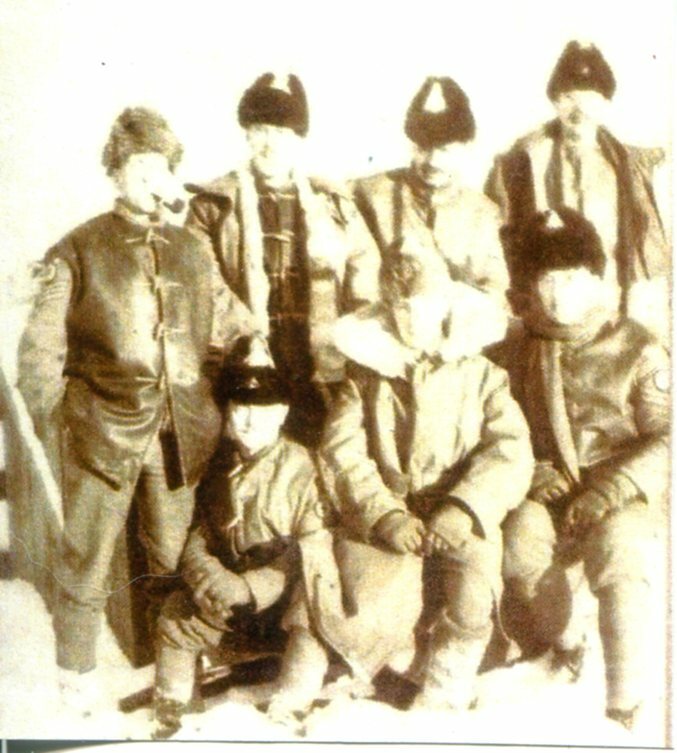 At the beginning of August 1918, the Allies had to neutralize a Bolshevik battery on the island so that their ships could reach Arkhangelsk. 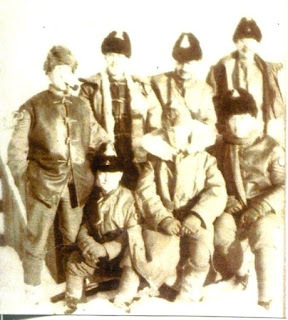 Afterward they established an internment camp on the island for Bolshevik prisoners. 5A wound serious enough to warrant a ticket home. 6The writer’s brother. 7See photograph. 8See photograph. 9Arkhangelsk was on the right bank of the Dvina River, near its mouth. 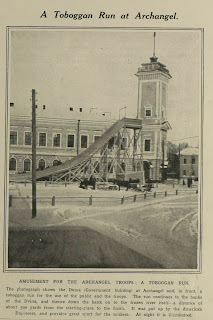 10British troops were transported to Murmansk on this ship. U-boats (tin fish) were a constant threat. 11A stamp dealer in Arkhangelsk. 12A suburb of Arkhangelsk. The stamps of the Russian Refugee Post in Constantinople 1920 - 1921 never saw genuine use. That is not to say that the originators of the stamp issues did not want to see them used. They did take elaborate measures to prove the authenticity of the stamp issues and some postal use would have added to the sense of authenticity. Below I reproduce two documents. 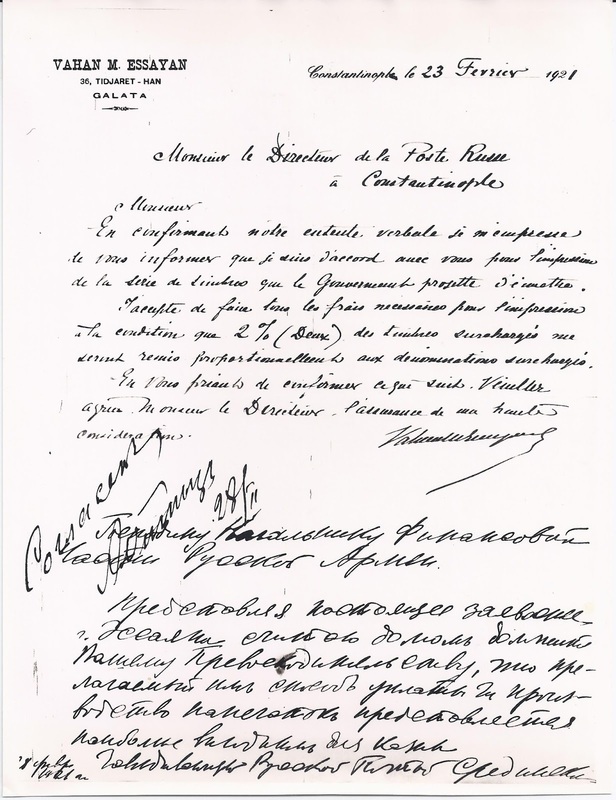 The simpler one in French records the printer Essayan's agreement to produce the second series of Refugee Post stamps in exchange for the right to retain 2% of the stamps overprinted, proportional to the number printed of each combination of stamp and overprint. 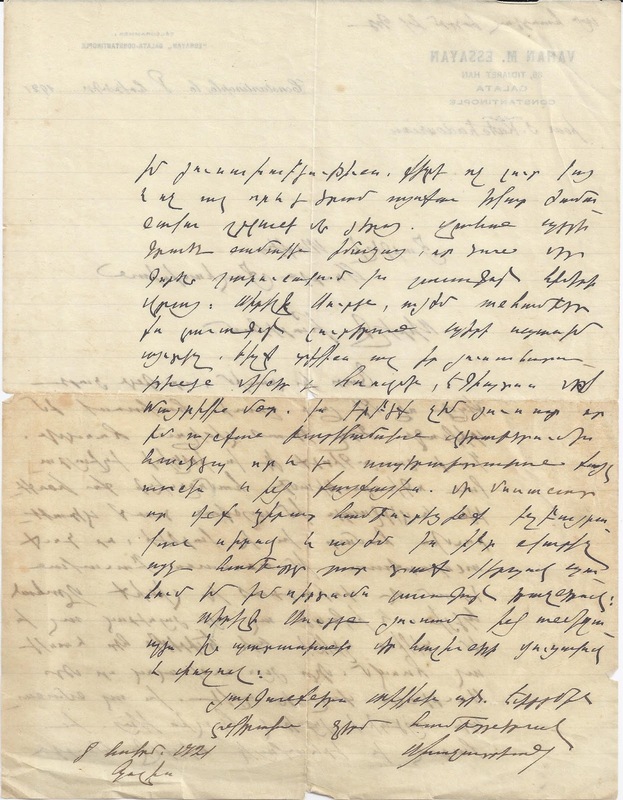 Refugee Post postmaster Sredinsky (later the stamp dealer Thals in Paris) has counter-signed. This document is reproduced from a photograph of the original, not a photocopy, so it probably dates back many years. It was in a collection written up in French on English Frank Godden leaves. I would guess 1940s or 1950s for the date of the photograph. 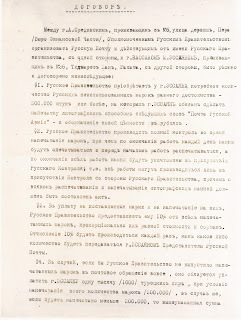 The second document over two sides and in Russian records the agreement made by Essayan to print the first series of Refugee Post stamps. 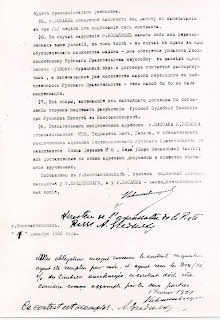 This contract is dated 11 December 1920 and is signed first by Essayan and counter-signed by Sredinssky and at the end they both confirm that the contract has been fulfilled with Essayan retaining 10% of the printing. 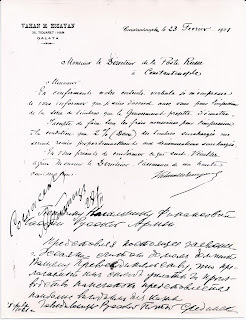 Like the previous document, this one is scanned from a photograph originally attached to an album page written up in French. Whatever the status of the Refugee Post stamps, these images do give us examples of the handwriting of Essayan and Sredinsky, and evidence of their fluency in both Russian and French.